Japan’s Largest Sports TV Network acquires 21U rights for all Samurai Games. Manager Katsuo Hirata pledged to make Japan world champions. TOKYO -- Top-seeded “Samurai Japan" unveiled its 21U National Team roster – the majority of players coming from Japan’s top league, Nippon Professional Baseball (NPB) – for the inaugural 21U Baseball World Cup in Taichung, Taiwan from 7-16 November. In total, 16 of the Samurai’s 24-man roster are currently with NPB clubs, including three players each from the famed Hokkaido Nippon Ham Fighers and the 2013 NPB champs, Rakuten Eagles. The remaining eight members of the Japanese National Team are from the highest ranks at the university level or are top prospects in the Industrial League. NPB’s clubs celebrated and were honoured that their players were selected to represent their country and are among the best 21U players in Japan and in the world. The selection of their players is also a source of pride and validation for their respective scouting departments. The Ham Fighters took to social media to help spread the announcement – posting the news on their website and to their 173k Facebook fans, generating over 9,000 likes and over 132 shares. The Eagles tweeted and posted to their 150k Facebook fans that three of their players had been selected to represent Samurai Japan. Young, top professional players include pitcher Naoyuki Uesawa of the Ham Fighers (8 wins in NPB) and Seiya Suzuki of Hiroshima Toyo Carp in his 2nd year (BA .344 in 36 games in 2014). 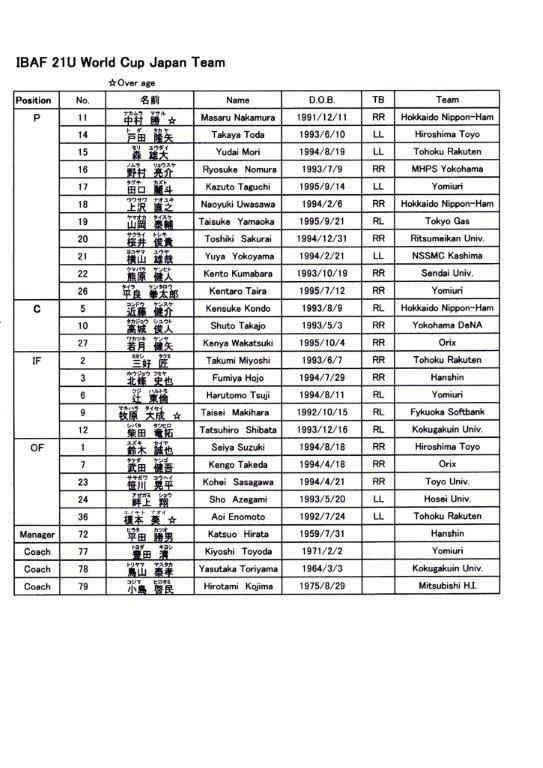 Three pitchers from Japan’s Industrial League on roster are: Taisuke Yamaoka (Tokyo Gas), Kyosuke Nomura (Mitsubishi Hitachi Power Systems Yokohama) and Yuya Yokohama (Nippon Steel Sumitomo Metal Kashima). 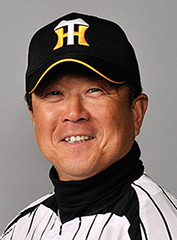 Manager Katsuo Hirata, current head coach of Osaka Hanshin Tigers minors, expressed his “honour” to be selected to manage a talented group of young Japanese stars and pledged to make Japan world champions. J-Sports, one of the largest sports TV networks in Japan, with a platform reaching out to 7 million households, has acquired the rights to broadcast all Samurai Japan’s games live, as well as across mobile and online platforms. Japan will be in Group B and open the world championship versus No. 15 Australia on Friday, 7-November. The Aussies also recently announced their 21U National Team roster fill with Australia's best young pro players.